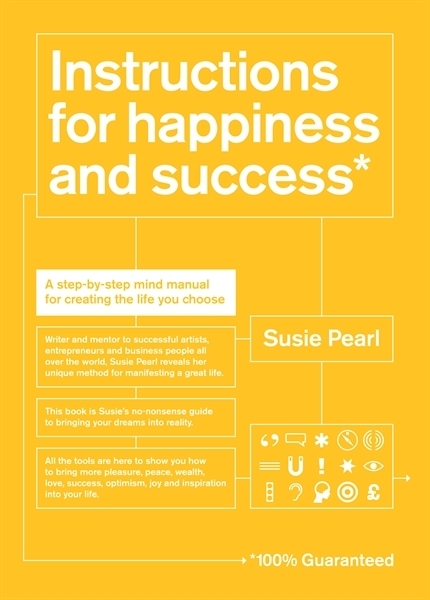 The critically acclaimed Instructions for happiness and success by Susie Pearl, delivers exactly what it promises on its bright yellow cover. Cleverly designed to resemble a ‘how to’ manual, this is a book of instructions for the mind. A step-by-step guide that shares simple but effective tools which demonstrate how we can bring more peace, wealth, happiness, success, adventure, optimism and joy into our lives, simply by harnessing the immense power of our brain. I recently met Susie at a David Lynch Foundation fundraising event. A happiness and well-being activist, Susie and has been studying the mind and working with leading scientists from around the world, for more than 15 years. She was the former MD of Paul McKenna’s training company (McKenna called Susie ‘the most positive person I know’). Prior to this she was the founder of one of the most successful brand PR agencies in the world, and during her career has worked with everyone from Michael Jackson to Madonna. Paul McCartney was the one of the first people to read her book. So what exactly sets this book apart from the huge selection of ‘how to be happy books’ on the market? For starters, it looks and feels very different to a typical book. Designed like a manual, it’s a ring bound; there’s lots of white space and large lettering; its brightly coloured and the sections are very clearly defined. It’s tactual; you want to pick it up and leaf through the pages, open flaps and write in boxes, and moreover, it engages the reader from page one. The content is clear, well written, informative, insightful and evokes beautiful imagery on almost every page. But for all the beauty, the science is there to back it up which I particularly loved. There are three main sections: How it works, The instructions and The took kit. Additional online audio tapes are also provided to work in tandem with the text, ensuring a doubly powerful experience. Having just finished reading Instructions for happiness and success, I really cannot recommend it highly enough. Over the years I have read dozens of books on the mind and how we think, as I’ve always been hugely fascinated by Neuro-Linguistic Programming. We create all of our experiences in life through our mind activity. Everything that shows up comes directly from the nature of our thoughts, emotions and words, and it’s really astonishing how little attention people give to their internal programming and mind activity. Susie explains how the law of attraction is always at play: when you are positively thinking of good things, you will attract them, and if you are focused on doom and gloom, you will attract more of it. Leave negative, toxic, bad news and gossip behind and focus on the good stuff. Our states and moods affect our emotions which in turn, affect how we filter our own versions of our lives and our personal perception of the world. All of this dictates how we vibrate and, therefore, what we attract towards us. Change your mindset and let life correspond with it. It all sounds very simple and it is, but there’s much more to it than just positive thinking and in this book, Susie’s no-nonsense practical guide will set you on the right path to manifest your wildest dreams. If there’s one book you should buy in 2013, it’s this one. First published in 2012 by Quadrille Publishing at £12.00. Buy a copy of the book here. CELLOPHANELAND* would like to thank Susie and Quadrille Publishing for the review copy.